Did you know that the Aquarium supports research and conservation projects around the world through its Marine Conservation Action Fund (MCAF)? With each of these MCAF projects, listed below, the Aquarium is helping to protect marine species, ecosystems and the communities that depend on them. 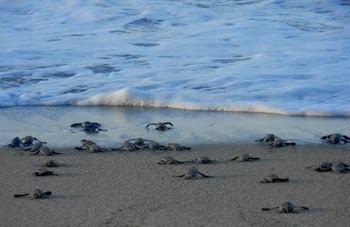 • Leatherback turtle nesting beach monitoring and protection program, Papua, Indonesia. • Sea ranger community patrol program for locally-managed marine area in Indonesia.